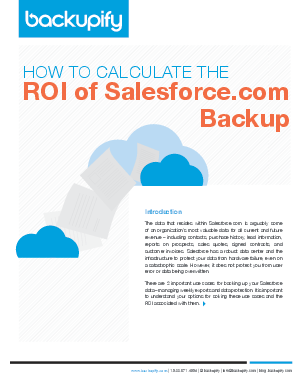 The data that resides within Salesforce.com is arguably some of an organization’s most valuable data for all current and future revenue – including contacts, purchase history, lead information, reports on prospects, sales quotes, signed contracts, and customer invoices. Salesforce has a robust data center and the infrastructure to protect your data from hardware failure, even on a catastrophic scale. However, it does not protect you from user error or data being overwritten.